Our move to Dénia, Spain is teaching us that many towns here are doing a great job of providing resources for foreign residents in Spain. We get so used to looking online for help, that we almost overlooked how our Spain home-base of Dénia is helping their foreign residents, here in person. It got us to thinking that this can be a resource easily overlooked when you’re moving to Spain. So learn from us and Dénia – if you’re interested in moving to Spain, it can help you take into consideration your choice of town or city, knowing that there are many places that will support your integration into their community. We learned about Dénia’s resources for foreign residents through Neil, a new friend and fellow expatriate here in Spain. Originally from Britain, he has been living in Dénia for over 6 years and is actively involved with the international community. When he learned of our interest in community activities and learning Spanish, he encouraged us to become involved in the ‘intercambio’ program that is hosted by the U3A (more on that below). 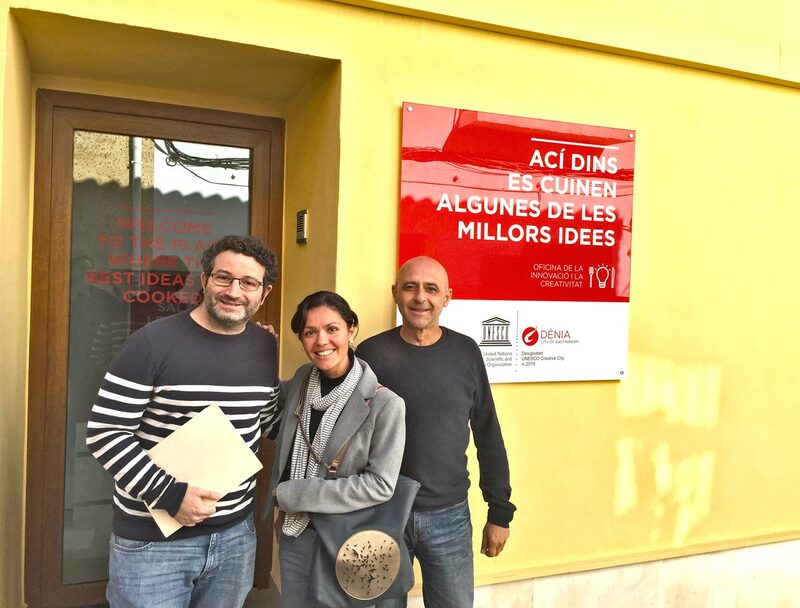 That is how we met Enric, who works for the Department of International Relations and Citizen Participation (known in Spanish as ‘Cooperacion y Relaciones Internacionales’) in the Ayuntamiento de Dénia (Dénia’s Townhall). 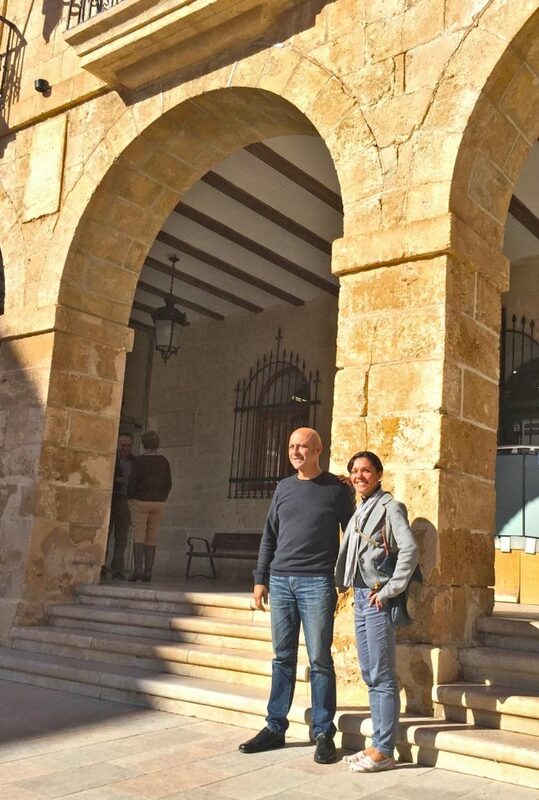 Above Image – Posing with Enric in front of Dénia’s Ayuntamiento. To learn more about this department and its benefits, we set up a time to meet with them. Enric has been working in this department since 2005 and is currently working in the position of ‘Gestor Atención Residentes Extranjeros’. In English that can be translated to Manager of Foreign Resident Resources. At the meeting we were also joined by the elected Councillor of International Relations and Citizen Participation, Oscar Mengual. Together, these two men and their colleagues bring a wealth of knowledge and support to the department and the foreign residents they assist here in Dénia. They generously shared their time and knowledge with us and it was a great meeting. Here’s more about what we learned. What Do Resources for Foreign Residents in Spain Look Like? Probably the most common resource that towns provide for their foreign residents are ‘intercambio’ programs or language exchange groups. The particular group we joined is formed by a partnership between a group called the U3A Dénia and Dénia’s Department of International Relations. Enric heads up the roster system where he can keep track of people who want to learn another language. From this list, he’s able to match up people as language partners, for example a native Spanish speaker here in Dénia with a native English speaker who now lives here as a foreign resident. It incorporates other languages as well, the most common after English being German, French and Italian. To further encourage this exchange of languages and cultures, the U3A also puts on a great Pub-Quiz, or trivia night, every month. Even in the off-season of winter, they get over 100 people attending! Other events are also hosted, such as concerts, speakers and tours of local sites here in this beautiful coastal area known as the Marina Alta. The other service provided is information regarding the day-to-day aspects of living in Dénia or Spain in general. This usually has to do with things like local laws, such as permits required for home renovations, laws about purchasing a home or renters laws. Or maybe you need help figuring out how to register for ‘empadronamiento’. This is registering as a resident of the particular town you’re living in so you are counted as part of the population and can benefit from the local and federal systems in place. While the latest facts and information are provided, the department does not refer or recommend specific businesses since that would be a conflict of interest. But they will make sure to steer you in the right direction and provide other resources that can connect you with relevant services for living here. Think of the department as a great in-person Help Desk, ready to answer questions, provide accurate information, and foster positive community development between the local and foreign communities. 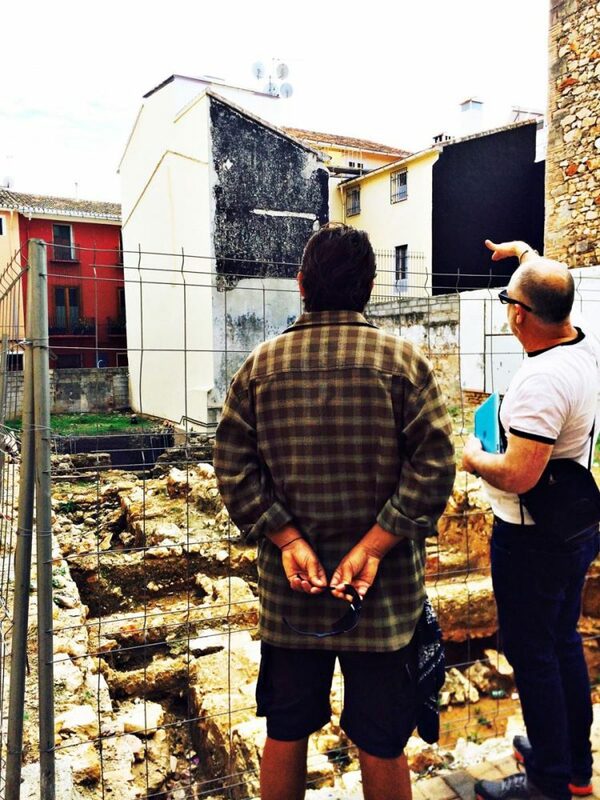 It seems like resources for foreign residents are an obvious thing that towns in Spain would provide, yet do not assume – there are towns in Spain that do not provide them or if they do, may not provide them very well. This can be due to a small population and size, which is many of the small villages throughout rural Spain, and the amount of time a town has had a significant foreign resident population. Let’s also remember that many times, these resources are not easily found online, at least not yet. So you may not learn of them until you are here in person. Above Image – We love the culturally diverse community we’ve connected with here in Dénia. There’s plenty of towns in Spain that only in the past decade or less are growing in foreigners. After all, have you heard of Dénia, Spain? It’s well-known among the British and other Europeans, but we find it unknown to Americans and other countries. A big assumption among foreigners moving to Spain is that living in a large city will automatically provide good resources for foreign residents. Yet the resources in cities can be confusing, chaotic and unreliable. There are plenty of great resources for foreign residents in the large cities in Spain. We simply have experienced that they tend to be online resources, forums and more independent private groups rather than the government, city ran programs. Whether you choose to live in a town or city in Spain, the government provided resources for foreign residents will most likely be something that you discover and connect with once you’ve physically arrived and some months into the throws of your new Spanish life. There’s no better way to benefit from these resources than from being out and about, exploring your new neighborhoods and meeting your new Spanish neighbors. We find that one of the biggest benefits of a town providing resources for foreign residents is the people-connection. It reminds us to get out into our community and not just be online all the time. 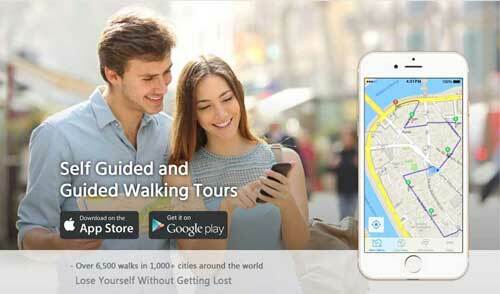 You can meet other internationals and foreign residents and hopefully some of the locals. Hey, in today’s times, ‘unplugging’ from the internet is something we have to consciously seek balance in, even as travelers or perhaps more so. It also helps you get to know your international community, like what other countries your fellow expats come from and what other cultures are represented. 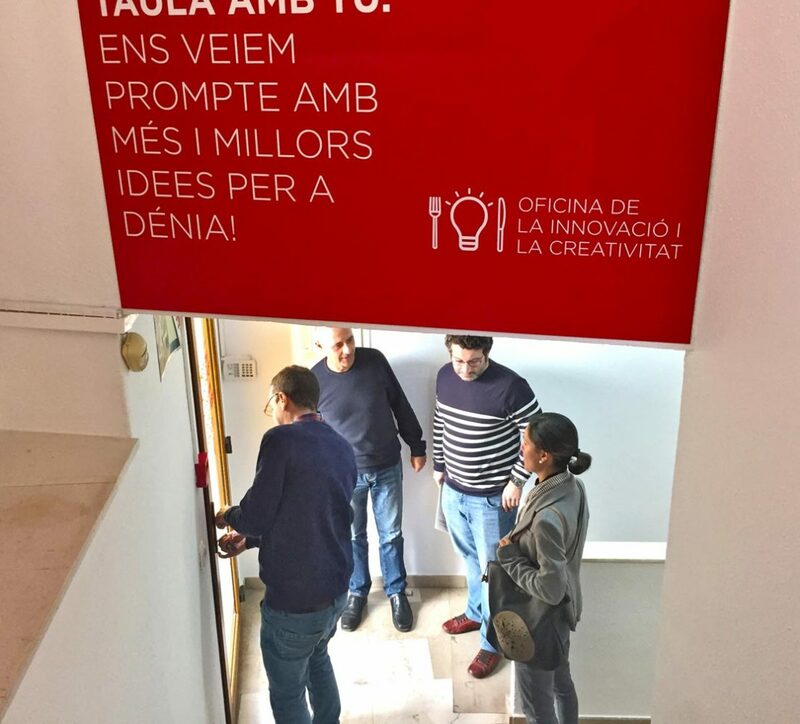 Above Image – Being introduced to Dénia’s Creative Department of Gastronomy. Turning to the local town and its government-provided resources for foreign residents also provides reliability. You can rest more assured knowing that the information you’re receiving is coming direct from the source, which is especially important when you’re looking into things related to local laws and regulations. There can be hidden gems about your town that you can discover through such a department. It was through our department of foreign residents here in Dénia that we learned about Dénia being designated by UNESCO as a Creative city of Gastronomy in 2015. We also got to spend time getting to know them, which you’ll get to read soon in an upcoming interview post. We’ve loved getting to know Dénia and the designated department that our wonderful town has for foreign residents. From Enric we also learned that the largest foreign population here in Dénia is German. After that is British and then French. As Americans, we actually love that there are very few of us here in Dénia. So far we only know enough Americans here to count on one hand, with us included! There’s a lot of great social events that the department also supports and helps advertise. They’re mainly groups that have been formed by foreign residents who want to share their passions and interests with others here in Dénia. Along with feeling more at home, it’s a great way to feel that thrilling energy of travel and diversity even while settling into a home-base. Above Image – Getting to know Dénia’s Townhall. We highly recommend that if you’re moving to Spain or just starting to consider living here, that you find out if the towns you’re looking at have a good department of international relations. Even if they don’t, it could still be the place for you. It depends on what kind of person you are and what you want out of life here in Spain. Either way, Spain is a welcoming and friendly culture, in the towns, small villages and big cities. As a foreign resident, you can’t go wrong choosing to live here. Just wanted to say thank you for this information. I knew about departments of international relations but hadn’t realised that they could be so personally helpful – think I’d assumed that they would just be beurocracy. You’re so welcome Helen. We’re glad that it’s helpful to you. Please let us know of any questions from your own journey and experiences with these international relations resources and departments. Thanks for reading and happy travels! Hi Elisa and Benny, Thanks for reading our article and we’re so glad that the information is helpful. We’re also thrilled you’re coming to Denia early next year. Great question about where to get more info on residency in Spain. There are many resources out there on the web, so it can be confusing to know which one is accurate and current. A site called ‘Expatica.com’ can be helpful. But I would recommend that you first and foremost contact your local Spanish Embassy in the US. The one relative to you will depend on where you live in the states. For example, the Spanish Embassy for when we lived in Denver, Colorado is in Los Angeles. Usually, you need to begin the process while still in the states, via your local Spanish Embassy, to get a visa for staying longer than 3-months. If in May you’re coming just to visit, then try and arrange meetings with services here in Denia who can assist you with the things you’ll need to do once you’ve arrived in Spain to live. Those are things like becoming ‘Empadronado’ (registering with the townhall), and getting your NIE (your identity number and card as a foreigner living in Spain). We have not worked with anyone for help on that and did it ourselves since I have dual nationality and know Spanish, so we don’t endorse those services here right now. But contact us directly via our contact form here on our site, and we can email you back some links to services that other expats here in Denia have used and refer for this portion of the process. We really hope this helps and please continue to be in touch about anything we can help with. Thank you and hope to see you in Denia one day soon! Hi, really enjoyed reading your article. We hope to emmigrate to Spain once retired but need Brexit outcome 1st. Denia is a possible place to live. Fingers crossed nothing will stop us ! Hello David. Thank you and we’re so glad that you enjoyed the article. We hope that you are able to make the move to Spain as well, and let us know of any other questions you have, especially as you consider Denia as one of the many great possibilities. Continue to enjoy our blog and happy travels! It’s great way to help people know what they want from moving abroad,many thanks for your effort and the time ..we just moving from London and we think we will rent first we tried barcelona in few visits..you’re right about big city..so we decided to try the south from around Malaga and going north we renting for a month in Torre de mar then driving passing Alicante with possible long stop in Denia..thanks for helping us and a lot of people like us. You’re so welcome Anna and Ahmed. And thank you for reading and sharing about your exciting plans. Malaga and Torre de Mar are two places that we have not been to yet, and hear are wonderful. Let us know what you think of them and how your trips go. And of course, we’d love to hear what you think of Denia too when you make it here. Renting first is a great option, wherever you decide to be. Enjoy your journey and hope to see you back here at our blog often! This site is a great source and I am glad that I have stumbled into it. For the past three years my wife and I have been searching areas between Altea, Benissa, Calpe, Xávea, Xávita and now Dénia. Of all of these locations, I am finding that Dénia appears to have many of the features and benefits that we are seeking such as proximity to both Valencia and Alicante, an array of housing that will better match our needs in an area that appears to be close to everything but yet somewhat sparse. as well as been coastal does help. We live in Dallas, Texas and we will be traveling these areas from early April to late May with the hope of finding the ideal location. Our goal is to find a place where we can not only enjoy our retirement but more importantly, we want to become part of a community and to reach this objective we want to join groups/organizations that are both socially and civically active in helping members integration into the community. I would love to join and would appreciate all of the feedback I can get in finding the right location to make our new home. Look forward hearing from you. Lionel and Patricia. Hello Lionel and Patricia. We’re so glad you found us and are considering Denia and this area to move to. You are definitely looking in the right place for achieving your goals. 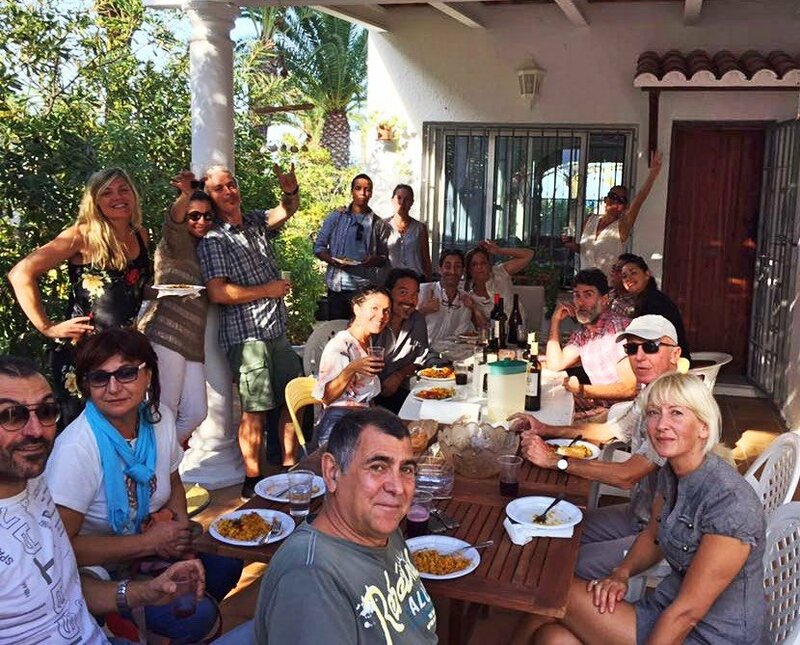 Denia has a great community of internationals and locals. There are wonderful groups to join, such as the Intercambio group, the Facebook Group Denia Connect, and many others. Not to mention that we would love to welcome you to Denia whenever you come visit, and if you move here. Let us know if you would like to meet up during your upcoming visit. And did you read the great guest post from our neighbor who just retired here from the US? They love meeting and welcoming people are considering to move to Denia as well, and they have such great first-hand experience to share: https://www.movetotraveling.com/retire-in-spain-american-couples-story-part-i/. Keep us posted and we hope to meet you soon and be of any help. You’re definitely doing your research! Well, we are obviously pretty biased, but we really love Denia above the other places. Javea (Xabia) can feel more British. Nothing wrong with that, it’s simply that being in Spain, we wanted a place that feels Spanish and is still actually Spanish. At the same time, Denia has a great international community as well. We will be in touch more soon via email and have great recommendations on some other resources for your search. And we know that Tara and Adam have great resources too. Be in touch soon! Amelia, Yes, I read Tara’s post and I tried to comment on our similar experiences but I guess it did not registered. I will try again later, as I find it very interesting that our personal experiences are not unique and thus similar in many ways to others whom are trying to take the plunge into the “third dimension” sort of speak. Pat and I will be in Dénia in early May and would enjoy meeting all of you while our week stay there. Amalia, I read Tara’s post with much interest as I discovered the similarities in experiences in many fronts. Later Pat read her post and we agreed that the similarities are striking. As we often do, while enjoying the fruity and volatile flavors of a good glass of wine as we engage in the brainstorming of ideas. 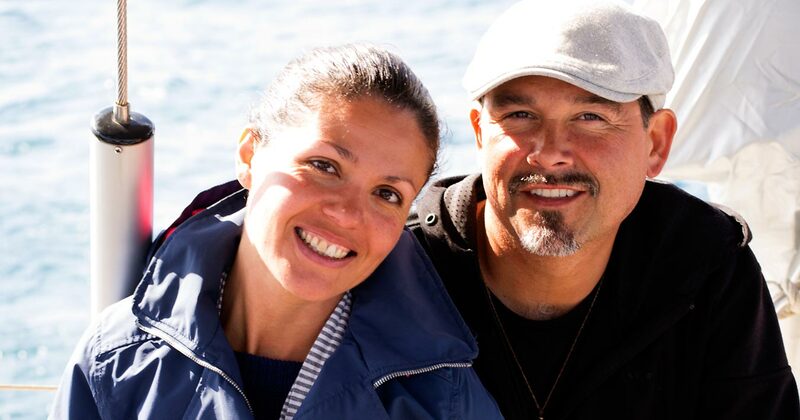 We are truly convince that there many other couples with similar reasons for new changes and adventures. Hope that we all can meet in early May while we are in the area as we will spent one week in Xávea and the other week in Dénia. Hasta luego. Hello Lionel! Thank you for reading Tara’s post. We did receive your comment there, as well as your other comment on this post just earlier, and we just needed to approve them before they show up. But it did register correctly. And thank you for staying in touch. We definitely want to meet when you come in early May and will coordinate something with Tara and Adam as well. We will be in touch more directly via email to plan more. Thanks again for reading and look forward to meeting soon!